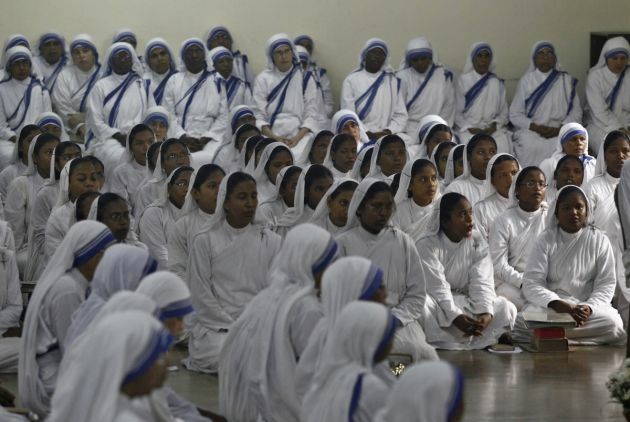 (Photo: REUTERS / Rupak De Chowdhuri)Catholic nuns from the Missionaries of Charity, the global order of nuns founded by Mother Teresa, take part in a mass to mark the 17th anniversary of her death in Kolkata September 5, 2014. Mother Teresa, a Nobel Peace laureate who died in 1997, was beatified by Pope John Paul II in 2003 at the Vatican. Vandals have defaced a Catholic church in the Indian capital, the latest in a spate of attacks targeting Christian places of worship in Delhi over the past two months. Thugs broke into the St. Alphonsa's Church in Vasant Kunj, south Delhi on February 2 by forcing open the main gate ucanews.com reported. The attackers entered the church through the sacristy, opened the tabernacle, and scattered hosts, Delhi archdiocese spokesman Father Savarimuthu Shankar told the website. Church officials believe the recent attack, as well as four previous attacks are meant to create a rift with the Christian community. "These attacks are definitely aimed at polarizing the community before state assembly elections but we cannot blame any political party until we have evidence," Shankar said. Investigators said they could not connect the suspicion with the probe because their initial findings appeared to indicate theft as the motive. "It is simply a case of robbery. We have filed a case and investigation is on," said area police officer Virendra Jain, part of the investigating body. With a rising wave of violence against Christians, Shankar said the community was preparing to hold candlelight vigil to protest the attack against St. Alphonsa Church. He expressed alarm over the aloof treatment of Prime Minister Narendra Modi and his government over the continuing violence against Christians in India. "It is getting very disturbing now. The community is left with no option but to come out on streets and protest," he said. Attacks against the Christian community have been recorded since December 1 when suspected arsonists torched the St. Sebastian Church in Dilshad Garden area. A few days later, attackers threw rocks at another Catholic church in Jasola district, and the building sustained minor damage. In January, two more attacks on places of worship occurred in Delhi. A church in Rohini had the crib of its Nativity scene burned. On January 14, a Catholic church was attacked and suspects smashed the grotto in the place of worship. Authorities have arrested three men in connection with this attack.